This garden was on a steep slope with overgrown plants, poor surfaces and tired lawn. The owners had just moved from the other side of the country and wanted a total contrast to their old garden. The brief was to remove most of the grass leaving one small level lawn and lots of different planting. There had to be hard surface access up and around the whole house which meant including many sets of wide comfortable steps. 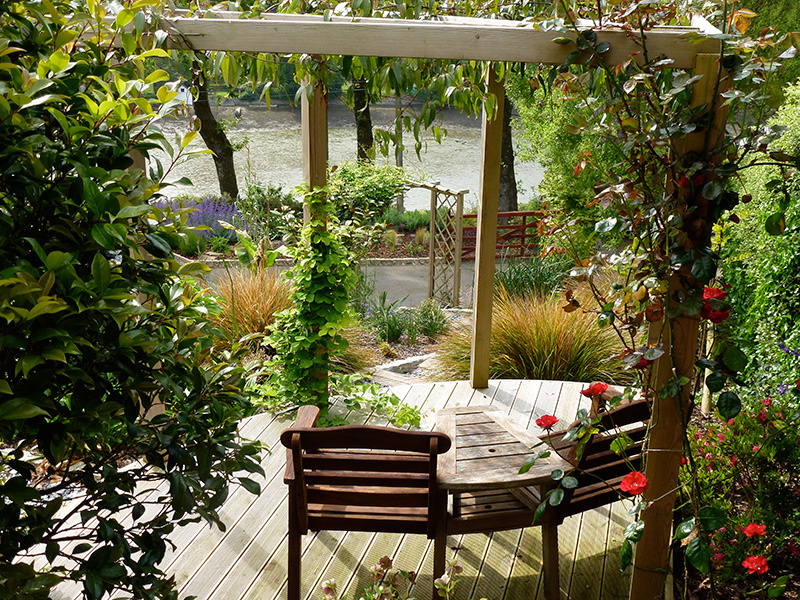 The planting encompassed various styles: to replace a huge lawn but with strict instructions not to obstruct the view of the creek below, ribbons of low growing Mediterranean type plants in blues and silvers reflected the path of the creek below; where height was not an issue a riotous jungle of plants, including bananas, fill the space; in other small beds up the terraces succulents are planted and under the overhanging balcony shade loving plants such as ferns and hellebores flourish. From the first consultation until the final planting Cathy’s knowledge and expertise have been invaluable. We now have a truly beautiful garden.